William Clark descended from a line of adventurous men. The Clark family first settled in Virginia in 1630. Clark's parents, John Clark, III, and Ann Rogers reared four children in central Virginia, including William's illustrious older brother George Rogers Clark. The family relocated to the frontier in Caroline County, VA in either 1755 or 1757. The other six Clark children of William's generation were born there, including William, on 1 August 1770. Although the family lived as far west as most settlers were willing to go at the time, the Clark family maintained an air of gentility in the community, attending balls, fox hunts, cockfights, and shooting tournaments despite the roughness of living on the frontier among hostile Indian neighbors in Virginia. The older Clark brothers received classical educations encompassing literature, geography, history, and the natural sciences. The family continued their westward expansion, moving to Louisville, Kentucky in the 1784, denying the younger children the same formal education, which explains William's creative spelling in his letters and journal entries while on the expedition. William was inspired by his brothers, George Rogers (the "conqueror of the Northwest"-Ohio at the time), and Jonathan, to pursue adventure and military glory. Both George Rogers and Jonathan had received letters of commendation and the rank of General for their service during the Revolutionary War, which started when William was only six years old. William enlisted in the army in 1789, five years after his family moved to Louisville. He joined Major John Heredin's regiment, stationed in the Ohio valley, which protected the Kentucky settlements from Indian attacks. In 1791, William fought under General Charles Scott's command against the Indians, in St. Clair's incursion, which proved to be a massive failure*. Four years later, he was transferred to General Anthony Wayne's unit. Wayne divided the men according to hair color in order to promote uniformity. Initially, Clark named Lieutenant in command of the fourth brigade. Meriwether Lewis was a member of the second. Eventually, Lewis was placed in the unit under Clark's command, and the two developed a deep friendship and respect for each other. Clark served throughout the Whiskey Rebellion of 1795 and 1796, and led garrison duties for the following years. He suffered from an illness that developed during his tenure with General Wayne, and in July, 1796, retired from military duty in order to help his family straighten out their business affairs. His brother George Rogers had run up several thousand dollars worth of debt. In 1799, Clark inherited a large amount of land from his recently deceased father, as well as some slaves. Among these slaves was a man named York, whom Clark had known since childhood, and joined Clark on the expedition. Clark and Lewis corresponded occasionally during the years between Clark's retirement from military life and Lewis's further military career and service as Jefferson's private secretary. During those years, Clark also met and married Julia Hancock, several years his junior, whom he met when she was 12 years old, and he decided he would marry her on her fifteenth birthday. In mid-1803, after Congress had approved the wilderness expedition that had been a pet project of Lewis's since 1792, Clark received an invitation from Lewis to co-captain the expedition. Clark eagerly accepted. The expedition progressed well under the co-leadership of the two men. There had been a slight mix-up on the part of the bureaucracy, which had assigned Clark a rank lower to Lewis's, as this was ostensibly a military-sponsored expedition. Lewis regarded the commission as nothing more than a mistake and treated Clark as an equal throughout the expedition. The captains took separate routes back east after reaching the Pacific. Lewis took a portion of the men and traveled over the land north of the Mississippi river, while Clark and the remaining men navigated the Yellowstone river to the Missouri river. The captains reunited again closer to St. Louis, and the Corps of Discovery entered St. Louis as one large party on September 23, 1806. After the expedition, Clark returned to his family home in Louisville, before traveling to Virginia in hopes of wooing Julia Hancock, which he did successfully. The government awarded him 1,600 acres of land and $1,228 in back pay. Clark was named Brigadier General of the Louisiana militia, to compliment Lewis's governorship of the same territory. He married Julia Hancock in January 1808. After Lewis's death in 1809, the responsibility of organizing, editing, and publishing the journals and scientific discoveries from the expedition fell to Clark. After much persuasion, he convinced Nicholas Biddle to undertake the task, as he felt his own grammar skills were insufficient to publish a book. He continued in his military capacity as well as more or less facilitating the publication of the book, which finally came out in 1814. Lewis's death also left a vacancy in the governorship of Louisiana. Clark was suggested for that, as well as recommended for the governorship of the Illinois territory. Clark declined both offers and Benjamin Howard assumed the office, serving until 1813. That year, Clark assumed the governorship of Louisiana, which became the Missouri territory in 1812. He also became the superintendent of Indian Affairs there. Clark governed almost until his death. He lost the governorship and remained the superintendent of Indian Affairs, which meant he was making less than half of the money that he did when he held both posts, but he still did considerably well. Julia bore Clark five children, but died in 1820, as did his daughter Mary. He lost his son, Julius, in childhood as well. Clark married Julia's cousin Harriet Kennerly Radford in 1821, who bore him two more children, one of whom died at less than one year old. The second Mrs. Clark died in 1831. 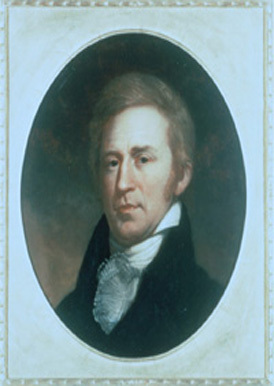 William Clark moved to St. Louis to live with his son Meriwether Lewis Clark in 1838, and died on September 1st, 1838. Bakeless, John. Lewis and Clark: Partners in Discovery. New York: William Morrow and Co., 1947. Jackson, Donald, ed. Letters of the Lewis and Clark Expedition with Related Documents. Urbana, IL: University of Illinois Press, 1962. Kinkead, Ludie. "How the Parents of George Rogers Clark Came to Kentucky in 1784-1785" in The History Quarterly. Vol. 3, No.1 (October 1928). Steffen, Jerome. William Clark: Jeffersonian Man on the Frontier. Norman, OK: University of Oklahoma Press, 1977.